I live in the middle of Rugby World Cup mania, so what else do you expect me to call my new black dress! I’ve had this vintage pattern for a while now, but couldn’t decide what to make it in. However during a clean-out-under-the-bed I discovered a long forgotten roll of black polyester knit that ticked all the boxes! 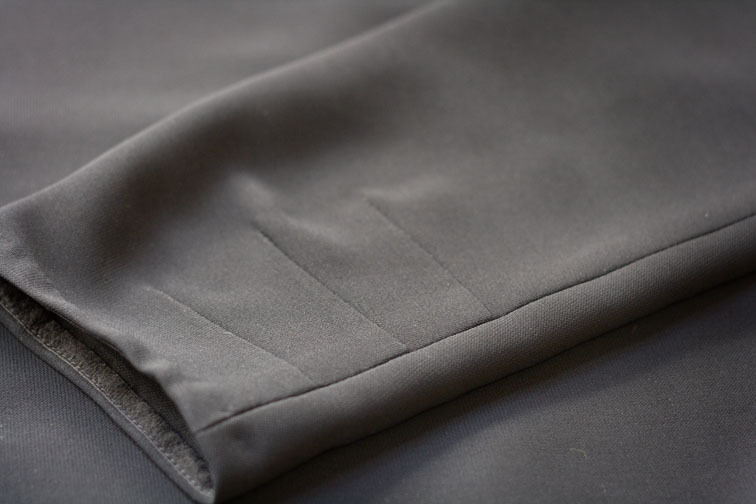 I normally avoid polyester but this is actually quite nice – it is matt, firm like a double knit, and sews and presses well. So you can see I’m not a total polyester snob, particularly when it involves using up old fabric. Although I bet this dress will be relegated to the back of the wardrobe as soon as the humidity arrives! 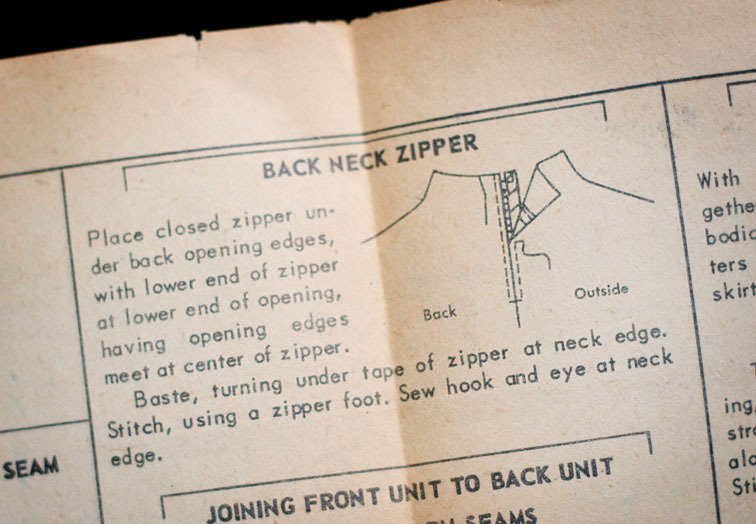 I’ve decided I want to stay true to the original design when sewing vintage patterns, so nothing was altered except the size – I’m afraid I am no longer a 33″ bust! The pattern is a Junior Misses’, I’m not sure what the difference is to a Misses’ but it fits me well straight out of the packet. 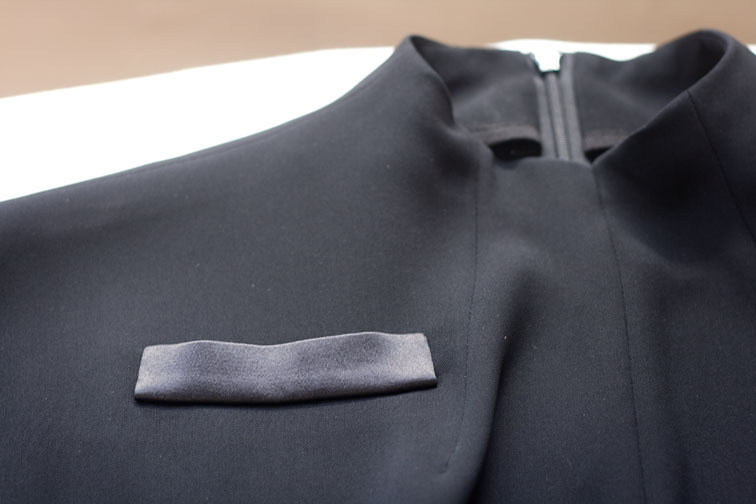 The sleeves have triple darts at the elbow – a nice detail don’t you think? 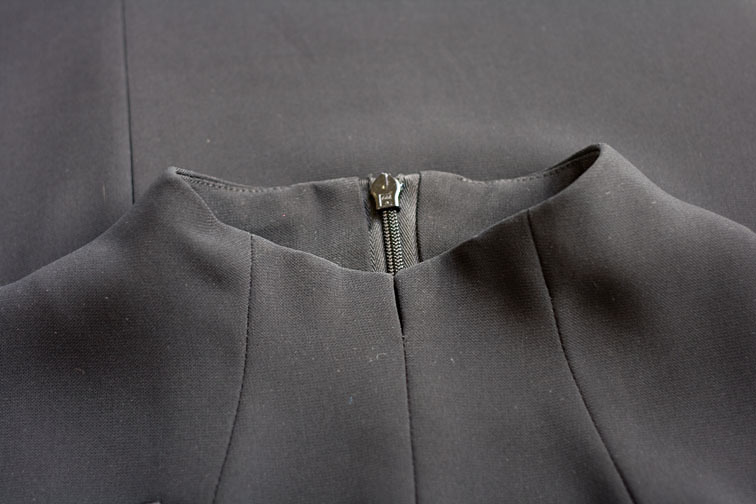 I always think this looks a bit huckery, so I inserted an invisible zip and faced it using my usual method. 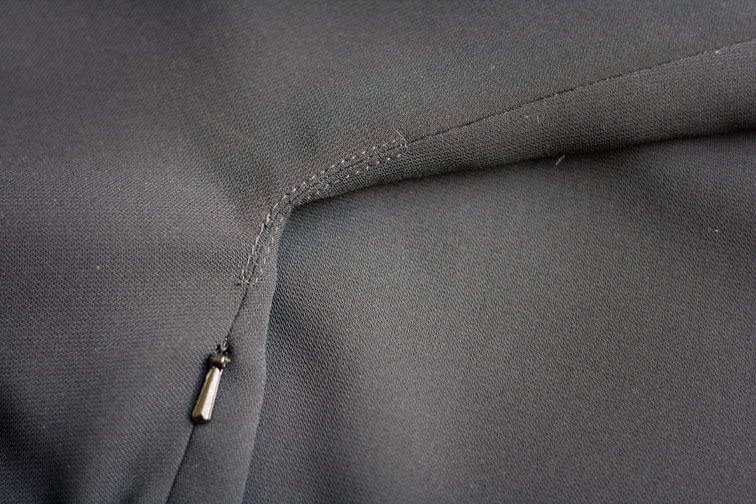 I inserted an invisible zip in the side seam too. The pattern called for bias seam binding to edge the neck facing – I didn’t have any of that, but I did have some stretch organza foldover binding which did the job nicely. 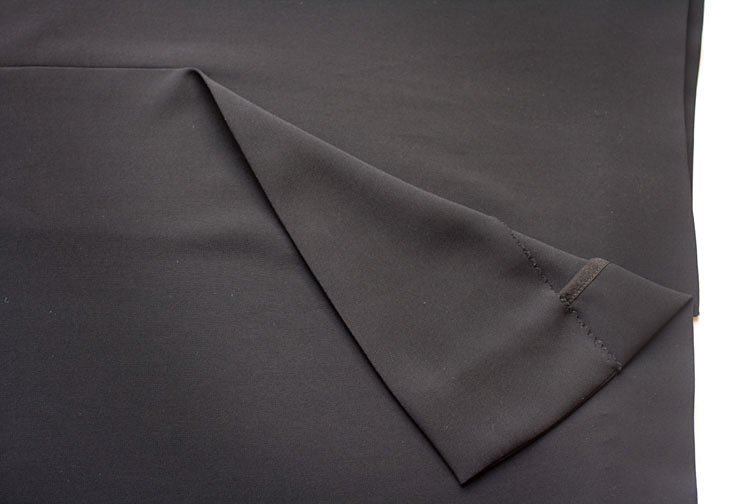 I also used it to bind the hem edges of the sleeve and skirt, although the sleeve hem really needed bias binding. 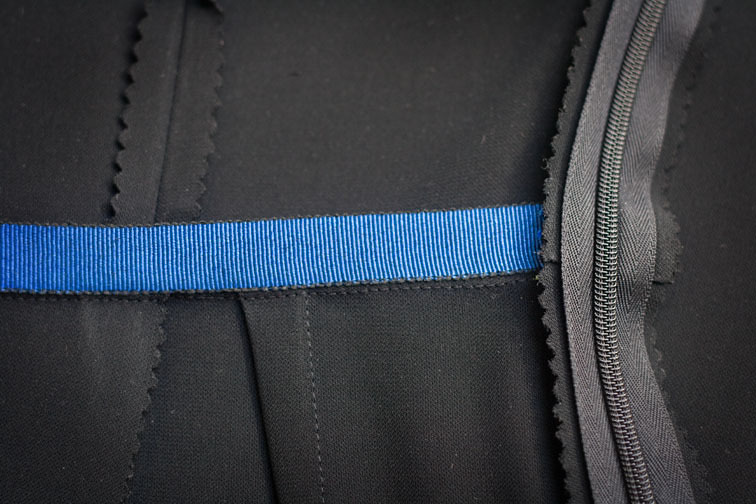 Some electric blue grosgrain discovered in my trims was used to fix the waistline. I enjoy surprise touches like this – they make me smile every time I put the garment on, plus it uses up all those strange colours in your stash! Overall I’m really happy with this dress, it’s very flattering and I think I’ll wear it lots. I may taper the skirt (after I’ve lost a couple of my winter kilos! ), as it is actually quite straight and not tapered as the illustration indicates. I’m even thinking about making the “graceful flare” version just for fun – what do you think? You have done an amazing job with this. All of the little details make it very special. Nice dress, looks much nicer in reality than on the packet. I am a little over the RWC myself. Being from Christchurch it is hard to get caught up in it even though my boys and husband all play the sport. Wow! so much work on the details! It looks like having been bought from high-end designer boutique! Job well done! oh my, this is lovely! Love all the details, and it fits you so well! Such an unusual design, love it! I particularly like all all the close up pictures of those fantastic details! What a gorgeous dress! 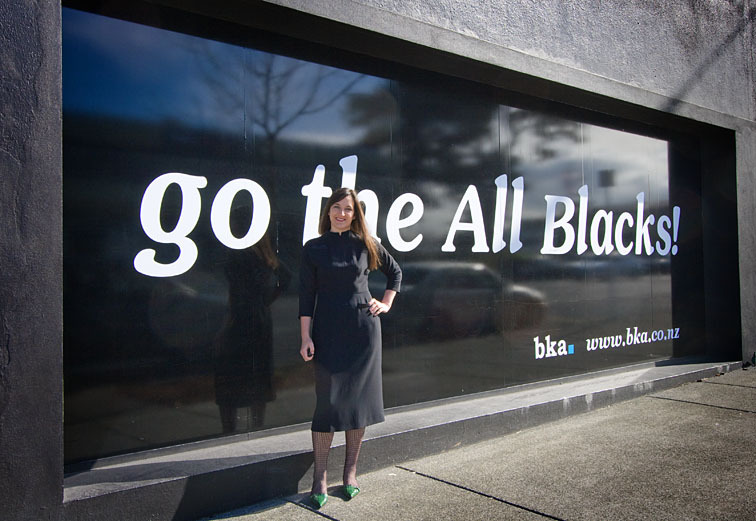 I'll cheer for the dress, not the All Blacks – unless the Aussies get knocked out. Love the use of pinking shears on the inside. Do they really stop fraying? That dress is tres chic. I would never have tried that raised neckline, but it looks amazing on you. I would like to see a closer up of you wearing the dress. Thanks for sharing all those little details. Love it. You are a true pro. Craftsmanship-quality handmade is always so much better quality and looking than factory made. So stylish! I love the detail photos & your explanation. I'm definitely more of a sewer, not a tailor, so I love learning about all the bespoke techniques. Gorgeous! You'll get so much use out of this. It looks great with your green shoes, too. 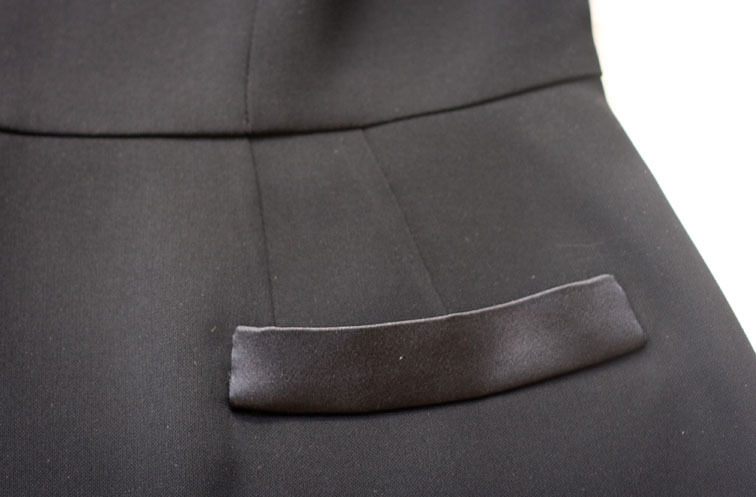 I can't believe how perfectly neat your zipper is at the center back seam. I'm going to have to go read about your “usual method”- mine are usually a hot mess inside. Lovely dress! 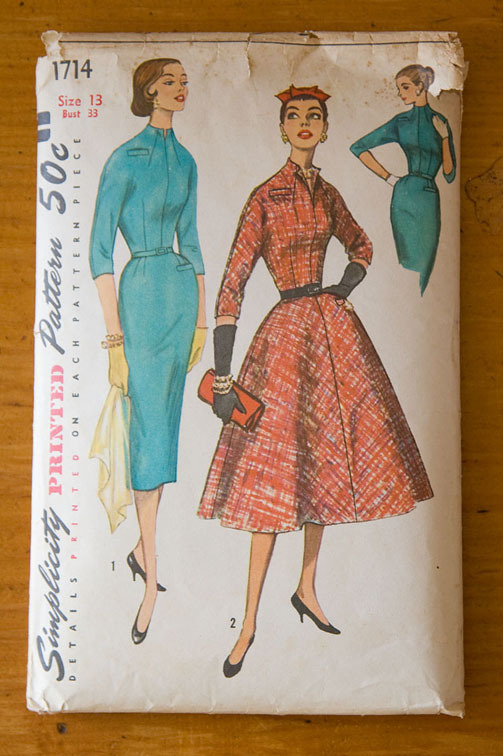 I have noticed that with all those 50's patterns that show a beautifully tapered skirt on the front illustration, are actually very straight. I usually taper the ends too for that proper 'wiggle' look. Thank you for showing the details of your fabulous dress. 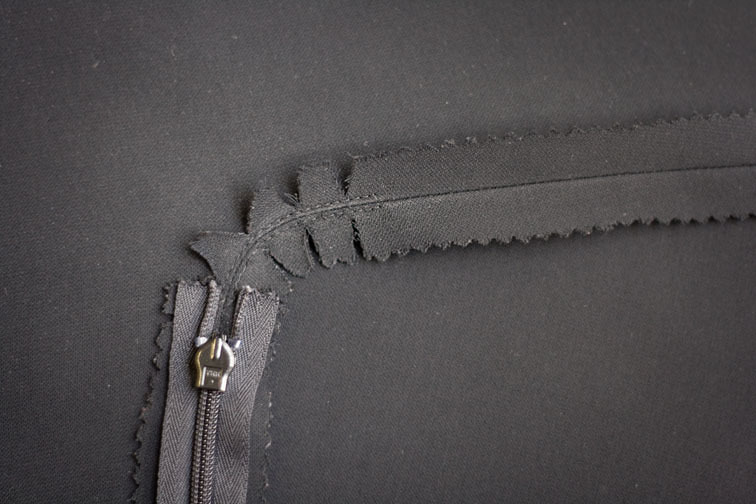 I love using the same method you use of inserting the invisible zipper with the facings. It makes the inside look very professional (which according to my mother is as important as the outside!). Totally gorgeous! I love all the beautiful details which, of course, you have sewn superbly. The overall look is very chic and elegant, perfectly capturing the retro lady-like look but still looking very modern. I think that a flared version will be lovely! You have such a good eye, to see the clean, modern lines of a dress in those rather poky pattern envelope illustrations. Lovely finished garment. The difference between Miss and Junior Miss was a matter of proportion — today we would tend to call Junior Miss a Misses Petite. Junior Miss patterns were aimed at teenagers with developing figures. Typically they were not as long in the bodice, with narrower backs. I dimly recall that they came in odd-numbered sizes (9, 11, 13, 15) instead of evens (8,10,12, 14, 16). But I am dim myself, so I could very well be wrong about that. Very chic, and I too would love to see a closer up shot of you wearing it. It's hard to see much in that picture… I think it is quite a modern looking dress, in spite of its vintage! 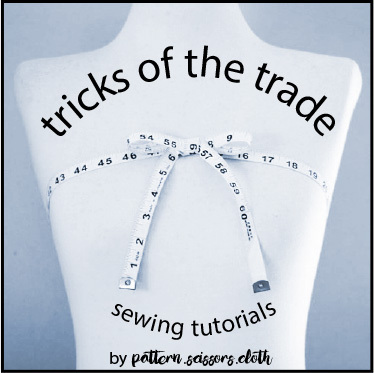 All your sewing details are so superb and it is a real pleasure to look at these little touches in all your wonderful creation! Wonderfully vintage yet modern chic. You look terrific in this dress and I so sappreciate the inside details. Those underarm reinforcing stitiches are nw to me and I'm going to borrow that detail in the future. I won't comment on the rugby side of things – but that is such a stunning dress you've made! Thanks for showing us the details – they look so perfect (which is not surprising at all). Yes, please can you post more photos of it on you? I love everything about this dress. The fit, those perfect details. I wish I was half as good as you. A lot to learn still. This is lovely, and I agree with everyone else, the details really push it over the top. I do like those three little elbow darts! I agree, very lovely. I'm taken with that funnel neck and the silk faux welts. 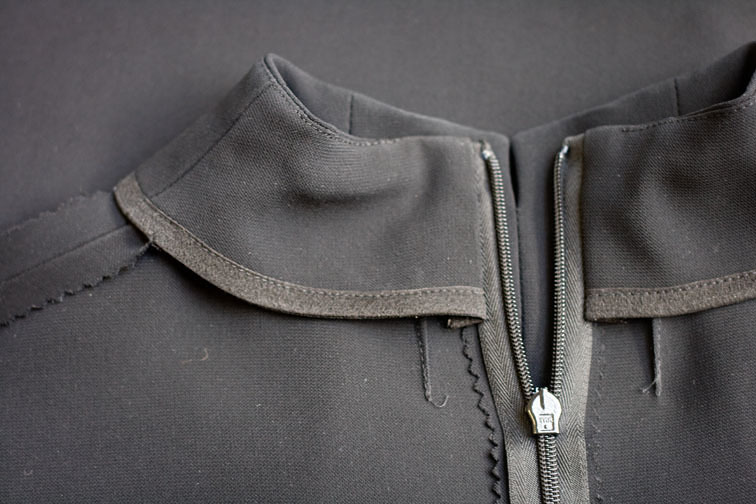 And two zippers!–that is a rare feature. So chic… definitely a forever dress. Amazing job. Your attention to detail is inspiring. Great style, perfect dress for winter. thanks for showing all the details. Love it and thanks so much for the details! I am printing this post so I can have it nearby when I make my dress. Beautiful dress! All those details are just so delicious! I have a question about the grosgrain ribbon you put in in the waist (love the color!) – it looks like there is a line of stitches above and under the ribbon in the picture from the inside, but I can't see anything like that from the outside. How is the ribbon actually connected? I have to admit, waist-stays confuse me somewhat! Gorgeous dress! I am so inspired to improve my sewing skills when I see your beautiful finishing. Go the All Blacks!! 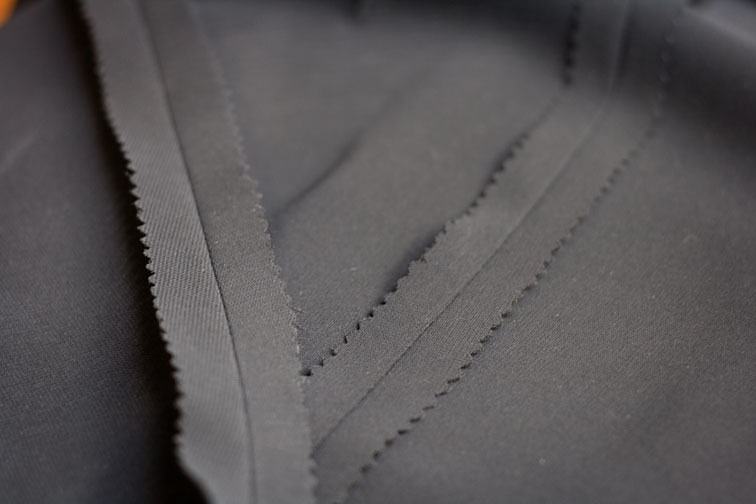 I love how you detail garments – fantastic!! Looks great on you – definitely you need to make another. This is the most interesting All-Black post I have ever read. Thanks for all the detail shots, your dress is beautiful and your construction details are fabulous. Wow, beautiful details. I enjoy the close-up photos of the finishing techniques. It's a good thing I didn't live in the sloping shoulder era since my shoulders are so square they almost point up. Beautifully made dress – Rugby fever must be exciting! Wow, the dress is beautiful and your finishings are just amazing! I love all the special little details you put into your garments . I hope you get to enjoy the games in your chic dress. You look amazing! I love the billboard photo. Good job! Well, what's to say! Beautiful as always. I like the three darts in the sleeve too. I would also like a close up photo of you in it. Being of different proportion, I could never wear the top so high up but gee I do love it, and it looks great on you. Like Kbenco, not only is this the most interesting RWC information I have read; it is the only stuff I have read! Gorgeous dress. The details are so lovely and really take it up a couple of notches. Great photo theme. A lovely dress and gorgeous sewing. Inspirational. I love how you have shown all the details up close. Together they make a distinctive black dress! What a great dress and I love you sewing! I too, wish for a better photo of the dress on. I always find it interesting to see how a vintage pattern looks on a real person; those illustrations are so dishonest when it comes to proportion! But, you've done a great job photographing the details. Aren't darted sleeves wonderful? My mom had a pair of pinking shears and used them on most everything. They're perfect for this fabric. I also think you're choice of fabric is perfect. Post-war, synthetics were very much in use. I'll risk being redundant and also comment on your wonderful skills; you're so very good at this!